Aluminum, brass, copper, metal, mixed media, steel, stone, thread and wood speak to the strength and delicacy of the 20 works currently on exhibit at Studio Place Arts. Inspired by the theme of play, "Art Works" is a group show of 13 artists that encourages viewers to do some "playing" of their own. Many works sit on freestanding pedestals placed throughout the main-floor gallery, evoking games in an arcade. As gallery visitors engage with the art, steel gears click and whir. Wooden and cardboard moving parts add clacks and other muffled sounds to this unorchestrated symphony. Some pieces, like those of Brattleboro sculptor Bruce Campbell, have sophisticated gearing and hand cranks that turn the wheels, putting everything in motion. In "Flurry," a steel and brass sculpture, Campbell created "snow flurries" that resemble a light snowfall or a furious storm, depending on how quickly the crank is turned. Four parallel sets of black wire rods, tipped with small white beads, bob and weave to create the effect of snow falling. 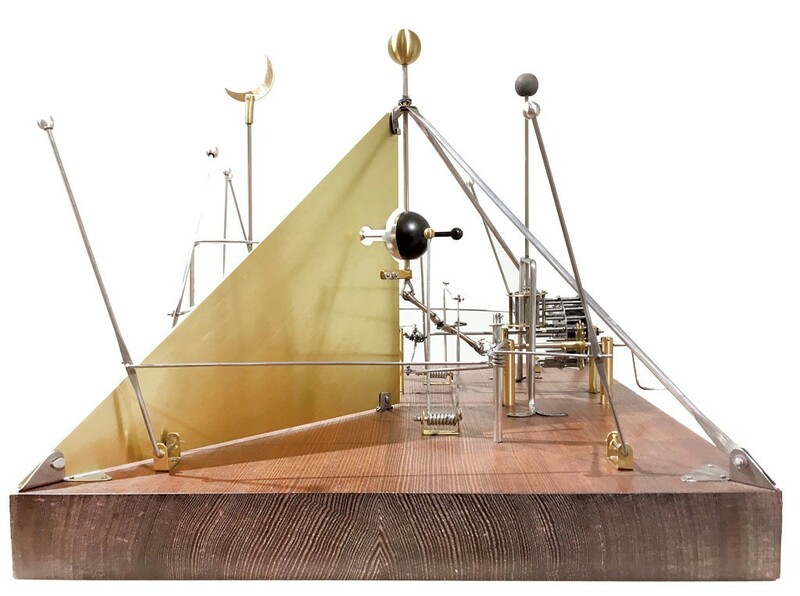 The show's kinetic sculptural works invite viewers to touch, interact and get creative. Even young children can try their hand, with supervision. A stone and copper sculpture by Susan Aranoff of Montpelier, "More or Less," offers endless possibilities for rearranging the stones into new shapes. She positioned it close to the floor so anyone can reach it. Painter Maggie Neale of Montpelier explores the concept of interchangeability in "Marine Docks," four small, square paintings hung together. Each can be easily lifted from the wall and exchanged with others. Neale adopts the revolutionary art tactic of putting the viewer in charge. "Stereoptical Storytelling Machine" by Robert Waldo Brunelle Jr.
"Stereoptical Storytelling Machine" (24 by 24 inches), near the gallery's entrance, is the first thing one sees upon entering. Visually, it echoes something out of an old penny arcade. The sculpture, by Robert Waldo Brunelle Jr. of Jericho, is a working stereopticon that offers three-dimensional views of sepia picture postcards. The young woman who appears in each postcard resembles a cross between a video game avatar and a Gibson girl. Brunelle has created a device that lives somewhere between an arcade of the future and one of the past, using a cartoon palette of primary colors to paint the wooden gears, beads, squares and thingamabobs that festoon the surface of his machine. The result is wondrous, greater than the sum of its parts. The stereopticon has a utilitarian bent, but it's no match for "Napier's Bones" by Paul Calter of Randolph. While he has just one piece on display, it's calculated to attract a crowd. The 16-by-12-inch wooden device is a manual calculator modeled after the one invented by Scottish mathematician John Napier (1550-1617). Calter provides instructions for using it to solve multiplication, division and square-root problems. The gallery notes indicate that Calter created the piece in 1981; a math teacher retired from Vermont Technical College, he probably got decades of use out of it. "Napier's Bones" suggests the fun that can be found in work and the excitement of an intellectual challenge. In Janet Van Fleet's "The Long Haul: Railroaded" (74 by 12 inches), two pulleys move a wooden wagon back and forth on a track leading nowhere. While Sisyphus probably found little joy in rolling a rock uphill only to have it roll back down, it is tempting to waste an afternoon moving the Cabot-based artist's haul of wooden sticks along the track. Despite the inherent futility, it's fun. Van Fleet's three sculptures in the show combine words, images, dolls and toys into well-executed environments that beg to be touched — and, in this exhibit, they can be. In "Dialogue I," which offers a glimpse into history's underbelly, visitors open drawers to view pictures of a slave market, victims of a Nazi gas chamber, trash on a beach in Norway, and more. Two figures hover above the drawers wearing signs that read "We Are Dying and Going Away Forever" and "We Want Your House and Ours Too." Like Campbell and Van Fleet, Nancy Dwyer gets great mileage from her materials — in her case, smooth, varnished pieces of clear pine. Letters made of rectangular wood sections spell out the words "If, Then." Mounted back-to-back on a dowel that can be hand-cranked, the two words endlessly repeat. "If/Then" is a common formulation in mathematics and logic, making Dwyer's work resonate with Calter's. 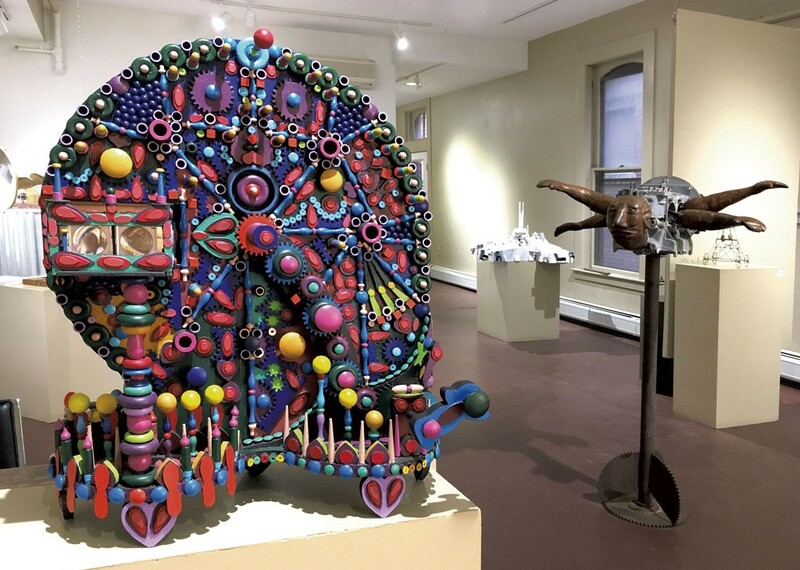 Plainfield artist Joe John uses vintage agitators, a VW engine block, crayons, paper and wood in inventive explorations of ideas and materials. His 36-by-42-inch flying "Ferdinand" rests on a 60-inch propeller-pole stand. Its head, arms and legs are made of carved wood; its torso is an engine block. The feet can be turned to propel the arms in a flying motion. Reminiscent of a ship's figurehead, the sculpture fits nicely into the penny-arcade theme. The centerpiece of the room, it's a visual magnet. While other artists use their work to interact with an audience, Tuyen Nguyen of Berlin uses the audience to interact with her work. "Dissection" consists of chartreuse-colored thread and eyehooks attached to the walls. (It took Nguyen a day and a half just to install the eyehooks.) A single strand threaded back and forth across the wall, from one hook to another, creates parallel lines and shadows. The work "dissects" parts of the gallery; viewers must move around the thread, thereby engaging with it. Initially very visible, the work seems to disappear as you become accustomed to it. Nguyen appears to be interested in presenting life's beauty and complexity in the simplest forms. Certainly the most understated piece in the show, "Dissection" ripples through the imagination like the sound waves emanating from a harp. If "Art Works" sums up anything, perhaps it's that play shouldn't be relegated to childhood. Appealing to natural curiosity and inspiring wonder are worthy pursuits for a lifetime. When art works, it really works. The original print version of this article was headlined "We Play, Art Works"